Includes 1/2 Tsp/2.5 g Measuring Spoon! 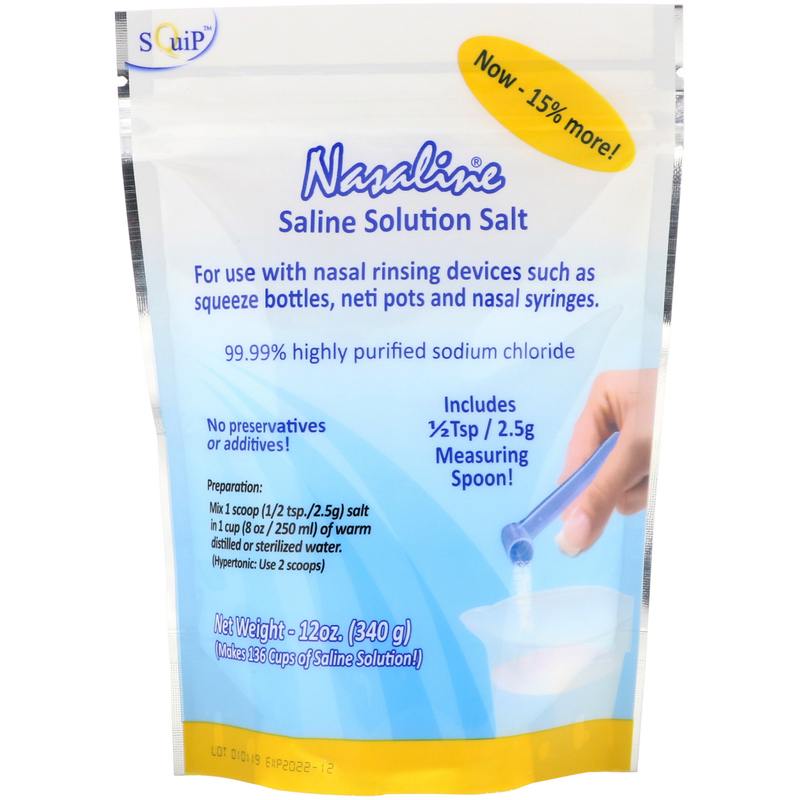 Makes 136 Cups of Saline Solution! 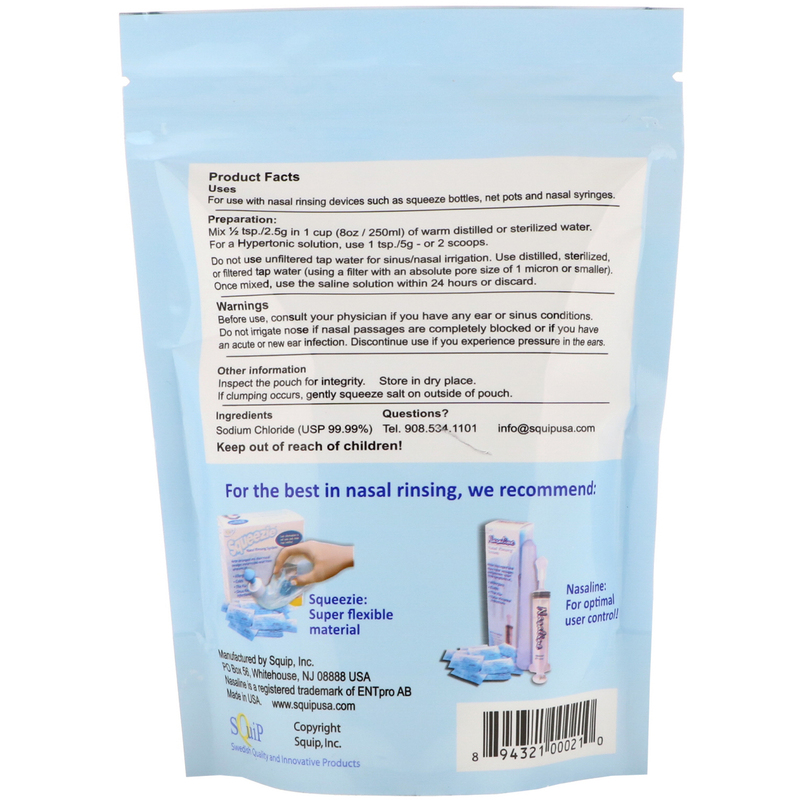 Uses: For use with nasal rinsing devices such as squeeze bottles, net pots and nasal syringes. Mix 1/2 tsp./2.5g in 1 cup (8 oz/250 ml) of warm distilled or sterilized water. For a Hypertonic solution, use 1 tsp./5g - or 2 scoops. Do not use unfiltered tap water for sinus/nasal irrigation. Use distilled, sterilized, or filtered tap water (using a filter with an absolute pore size of 1 micron or smaller). Once mixed, use the saline solution within 24 hours or discard. Before use, consult your physician if you have any ear or sinus conditions. Do not irrigate nose if nasal passages are completely blocked or if you have an acute or new ear infection. Discontinue us if you experience pressure in the ears. Inspect the pouch for integrity. Store in dry place. If clumping occurs, gently squeeze salt on outside of pouch.